« Can you choose to be a success or failure? HARTFORD, Conn. (AP) — A severe storm packing hurricane force wind gusts and soaking rain swept through the Northeast early Monday, knocking out power for more than 700,000 and forcing hundreds school closures in northern New England. Some utility companies warned customers that power could be out for a few days. The New England area appeared to get the brunt of the storm, which brought sustained winds of up to 50 mph in some spots, with a gust of 82 mph reported in Mashpee on Cape Cod in Massachusetts. In southern New England, Electric utilities National Grid and Eversource combined were reporting more than 300,000 customers without power in Massachusetts as of about 7 a.m. Monday. About 152,000 Eversource customers were without power in Connecticut, while United Illuminating reported about 5,700 customers in the dark. National Grid had more than 140,000 customers without power in Rhode Island. Maine and New Hampshire also got pounded. The Portland International Jetport in Maine recorded a wind gust of 69 mph, and the Amtrak Downeaster service canceled a morning run due to down trees on the tracks. In Maine, about 240,000 power outages were reported and downed trees closed a number of streets. More than 200,000 customers were without electricity in New Hampshire, where hundreds of school districts canceled classes Monday and others delayed openings. 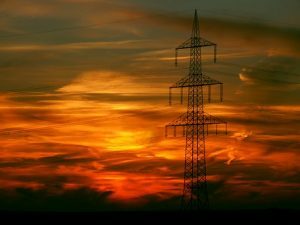 It can be very frustrating and difficult to be without power in the 21st century. But let us not forget what happened to many from the recent hurricanes. People in Florida and Texas lost power, homes, etc. Then there is what happened in the Caribbean. Deep in their hearts, four former IPFW volleyball players didn’t want to believe the damage in hurricane-ravaged Puerto Rico was as bad as had been reported. They wanted to believe there was some semblance of hope the situation had been oversold. Instead, everything was unbelievably worse. “I don’t cry, ever, but the second house we went to I was in tears,” said Jeff Ptak, a former all-American who played professionally for six years in Puerto Rico. “The entire island … doesn’t look the same. The entire island is destroyed. If your house was made of any kind of wood, it’s just gone. “Everything that are usually simple daily tasks are extremely complicated,” said Pepa Ralat, who lives in Weston, Fla. “Things that in Fort Wayne take you 10 minutes, in Puerto Rico takes you an hour. Traffic is very complicated with the roads being lost, a lack of power and the desperation of people. I was extremely surprised with how much damage the hurricane caused all over the island, on the infrastructure and everything. In the 21st century, not having electrical power for weeks or months will be a burden for those affected, will greatly impact their ability to work, disrupt communications, and will even impact food supplies. The 2017 season is one of only six seasons on record to feature multiple Category 5 hurricanes. This was the second season on record (after 2007) to feature two hurricanes making landfall, with Category 5 Irma’s landfalls on multiple Caribbean islands and Maria’s landfall on Dominica. Now, the nations and territories in the Caribbean did have some money before. They knew they were vulnerable. But, in general, insufficient preparations were taken. After Hurricane Maria, more in the Caribbean are probably realizing that the islands should have taken more steps to protect themselves. The people there realize that they are vulnerable to hurricanes. Not enough steps were taken before Hurricane Maria hit. 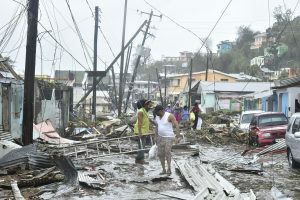 Sins were multiplied by looting after Hurricane Maria hit. Since that was published, we have had record smashing heat, stronger hurricanes, and odd weather problems. There was a severe food shortage in St. Martin last month because of Hurricane Irma. There has been chaotic looting in the Caribbean and Florida. These issues should serve as a wake-up call (for information about Bible prophecy and hurricanes, here is a link to the video: Hurricanes and Prophecy). The Bible is full of warnings, but many do not understand them and will not heed them. Do not think that those in the Caribbean, Florida, Texas, or the Northeast are more sinful than others. Devastation will hit other places (see also Four Horsemen of the Apocalypse). While most feel that prophesied dangers will affect them, the biblical reality is that almost all humanity will fail to heed the warnings (see When Will the Great Tribulation Begin? 2017, 2018, or 2019?). This entry was posted on Monday, October 30th, 2017 at 7:00 am	and is filed under Prophecy.